In the Old Barn on Saturday, UBC men's ice hockey pulled off a comeback for the ages, beating the Lethbridge Pronghorns 4-3 in overtime. "It was something special we witnessed today,” said head coach Sven Butenschon in his post-game presser. The first period saw a fairly even matchup, with both teams spending a bit of time in each others’ zone, but ultimately unable to find the net. Spearheaded by a potent counterattack, the Pronghorns exploded for three goals in the second frame and looked to sweep the weekend series. 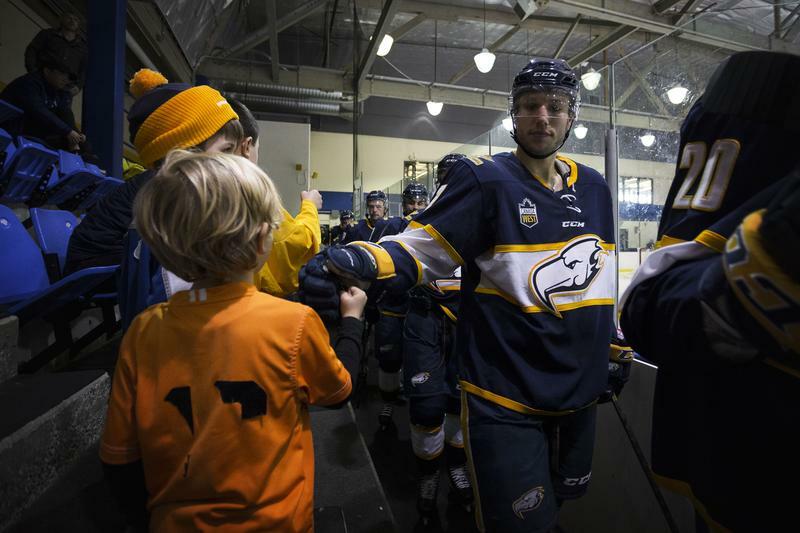 Not a group to give up, the T-Birds rallied back and took advantage of a 5-on-3 courtesy of two Pronghorn penalties, netting their first goal off a Jerret Smith slap shot. Smith would live up to the “C” badge on his jersey by scoring every subsequent UBC goal to equalize the game. In overtime, Austin Vetterl and Smith connected for the winning goal off a 2-on-1 breakaway. It was Smith’s fourth goal of the game in a matchup the ‘Birds will remember for a long time. More details to come in this week's edition of Behind the Boards. Meanwhile, in Lethbridge, the women’s hockey team pulled off a 3-0 shutout against the Pronghorns. In a game of chances, UBC outshot their opponents 33-25 and made sure to pounce on any loose pucks, which was how they scored their first goal — an Ashley McFadden rebound. With the win, Thunderbird goaltender Amelia Boughn tied a team record for most shutouts in league play with nine. The remaining goals came off of wrist shots, courtesy of Rylind MacKinnon and Hannah Clayton-Carroll. 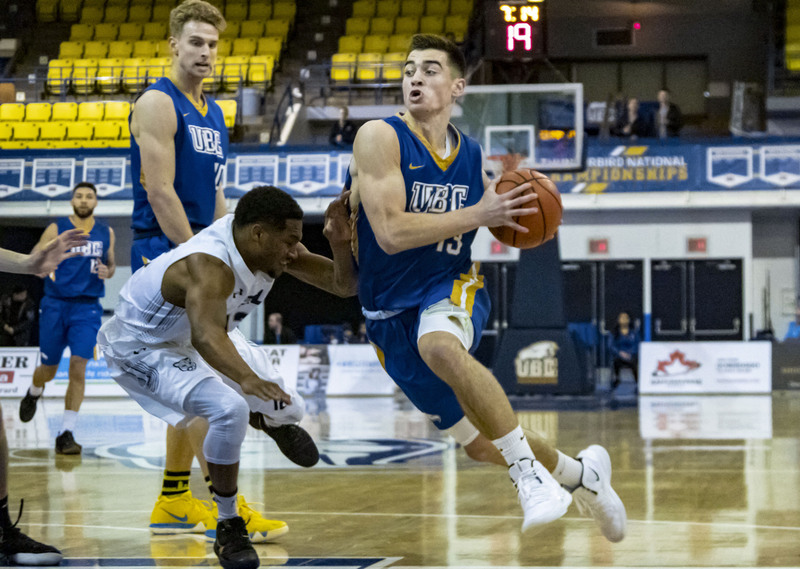 Playing in front of a festive crowd, UBC men’s basketball swept their weekend series against the Mount Royal Cougars, winning the first game 94-77 and the second 113-83. In Saturday’s game, sophomore forward Grant Shephard ran the show, leading all scorers with 29 points and 8 rebounds, on 78 per cent shooting. Teammate Patrick Simon also had a well-rounded game, posting a 18-7-5 stat line also at forward. After a back and forth first quarter, UBC asserted their dominance in the second, pulling away to a double digit lead. In the third, Shepherd went on a run, using his athleticism and strength to abuse the Cougars’ weak rim defense. Up 29 points, head coach Kevin Hanson cleared his bench and the Thunderbirds cruised to victory. On the women’s side, they too swept their series against Mount Royal before the holiday break, winning Saturday’s game 95-72. The T-Birds were spurred offensively by senior guards Maddison Penn — who tallied 19 points, 12 rebounds and 4 assists — and Jessica Hanson, who recorded a double double (10 points, 10 assists). UBC out-rebounded their opponents 52-30, showing their dominance in the paint. At the same time, they also shot better with a cumulative team percentage at 51 per cent versus 35 per cent. It was a well-rounded game for the Thunderbirds whereby they balanced offense and defense effectively. Moving on, the men’s team faces the Seattle Mountaineers in an exhibition game at War Memorial Gym on December 16. The women’s team returns to action on January 4 against UBC Okanagan at War Memorial. The UBC Thunderbirds (2-9) go into their break on a bit of a sour note coming off 3-1 and 3-0 losses to the Mount Royal Cougars (8-3) in Calgary Friday and Saturday nights. In Saturday’s game, the ‘Birds made it a ‘competitive’ sweep, losing their sets 25-19, 25-16 and 25-20. There were some silver linings, however, as rookie Michael Dowhaniuk had seven kills and one block, and third-year Middle Jordan Deshane also had seven kills. Additionally, sophomores Nick Mickelberry and Zec Johnson added four kills and three kills respectively. For much of the game, UBC did a fine job keeping up with the Cougars, but were unable to take the lead due to sustaining large early deficits. Regardless, the young core showed a lot of promise in their mental tenacity to keep the game competitive. Next up for the 'Birds is a matchup versus Calgary in the Tru Macdonald’s Classic in Kamloops on December 28.